The issue opens with Supergirl meeting up with her cousin and it just happens to be the Kryptonian "Day of Truth". It's a day where Kryptonians can't tell a lie and a setup for a Supergirl one-liner leading to an assault by the Emerald Empress. Okay, I know I was hoping to get some Emerald Empress action here, but I really don't know what happened here. She showed up out of nowhere, yelled at Kara and then disappeared. Really Superman tries to explain it all, but even he seems off in this book...like he's a caricature of the Superman we've been seeing in the other books. After we see that Batgirl is also in town, the Super Duo head off to see the sites of National City. They bond a bit and Kal tells Kara that he knows that Eliza loves her. It's all nice enough, but nothing new to Rebirth readers. They then go to the Fortress of Solitude where Kara meets Jon and it's a nice scene with Jon asking a million questions about everything and leads to a family dinner at the Kent house. Again, it's nice to see Kara meet Lois and there are some funny moments when Cat Grant's name comes up, but nothing earth shattering. That when we get some Superman Reborn recap and a big reveal...nobody remembers that there was ever two Supermen! Okay, now that is something. 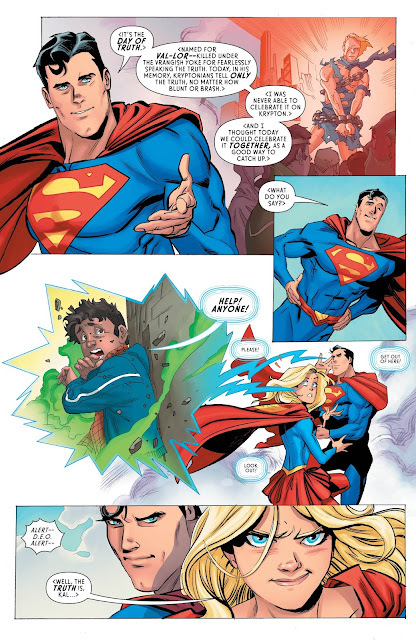 He also wants Kara to join him in the eventual fight against Mr. Oz. 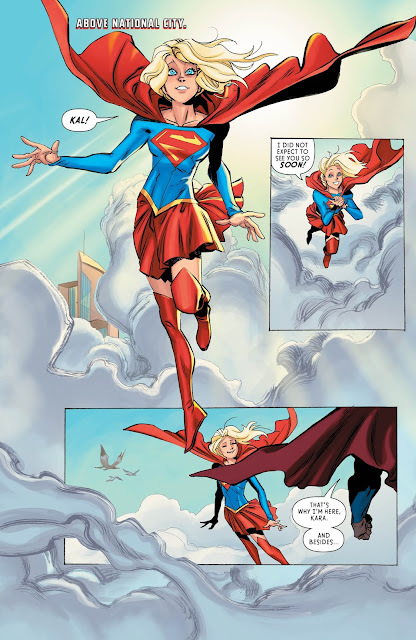 The issue ends with Supergirl getting her next mission from Cameron Chase and it will lead he head on into Ben Rubel and Batgirl. I know the later is more exciting, but we can't forget about Ben Rubel, right? Right?!? This was an okay issue of Supergirl that may not give the reader what was advertised, but does give a little Superman Reborn tidbit that was good to know. 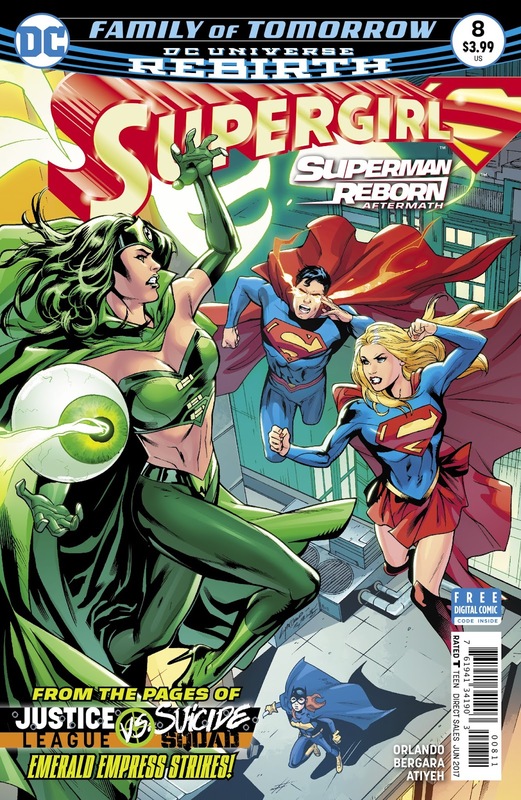 The problem with this book, however, is that it always feels like a lesser version of the big Rebirth books. That feeling goes with the art as well. The cartoony style looks cool and all, but it never screams "big" or "important". I guess it fits the tone of the book, but that's part of the problem, at least for me. 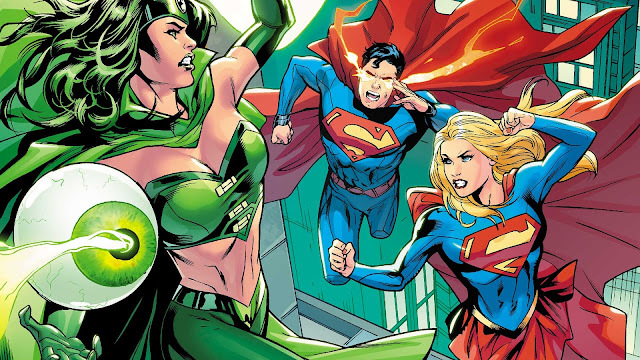 Those showing up to learn more about Rebirth will leave disappointed, but those who have been reading will already know the drill. This issue is nice and that's the best I can say about it, but after 8 issues, nice just isn't cutting it. I want more and I am growing impatient waiting for it.